J.T. Miller, 25, skated in 82 games last season, splitting time between the New York Rangers and Lightning. 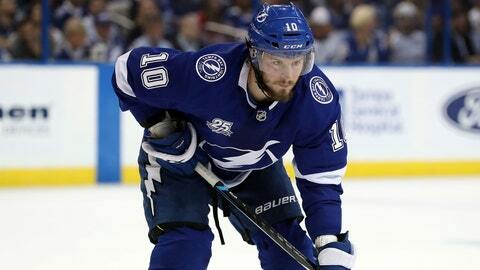 TAMPA, Fla. (AP) — The Tampa Bay Lightning have re-signed forward J.T. Miller to a five-year contract worth $26.25 million. Acquired from the New York Rangers at the trade deadline, Miller put up 18 points in 19 regular-season games with Tampa Bay and then eight more in 17 playoff games. The 25-year-old Miller has 82 goals and 108 assist in 360 NHL games. Miller’s contract puts cap-strapped Tampa Bay closer to the $79.5 million ceiling, with new contracts still needed for restricted free agent defenseman Slater Koekkoek and forward Cedric Paquette. The Lightning are one of a handful of teams set to meet with New York Islanders star John Tavares in Los Angeles to try to persuade the pending free agent to join them.